Over the Fourth of July weekend I came across The Atlantic essay “She’s Still Dying on Facebook” about viewing a dead Facebook friend’s account long after she’s gone. It was heartbreaking, sweet, and very relevant. Death in the digital age creates a whole new set of issues to examine, and it’s unfamiliar territory. I have dealt with it myself. Last year my grandmother died of cancer. Her Facebook account still exists—both actually, she had two. Her death opened up a sea of complications about online presence, questions of perspective, the wishes of the living versus the dead, and generational differences. How do you view your Facebook? Do you use it to communicate with your friends or to share your opinions? Is it a tool for self-promotion? A place to stalk crushes? Do you think it’s stupid or fantastic? 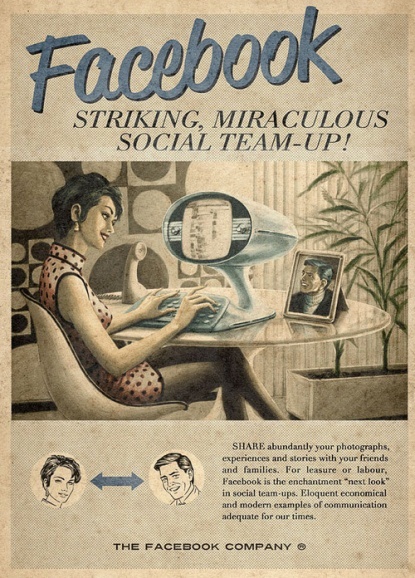 And just as importantly, how do other people see your Facebook? What will it represent to them when you die? Is it a collection of all your most significant life events and memories, as worthy of preservation as a diary? Or is it the CliffsNotes version of you, meaningless and surface-level? Should it be memorialized or destroyed? I doubt any of us were thinking that hard when we first made our accounts. Facebook played an incredibly complicated role in the last year of my grandmother’s life, and a lot of that was due to no one really knowing how important it was or was not. It’s why the question of what to do with her accounts is unresolved to this day, and will probably remain unresolved forever. On the one hand, Facebook was revolutionary. All of my grandmother’s friends and family joined a group to share stories, updates, and photos with her. She could connect with everyone, even when she was too sick for visitors, and they could all connect to each other. My mother and aunt ran the group and managed the posts to share with my grandmother. It gave her a lot of comfort and eased her passing. On the other hand, Facebook is an emotionally-charged platform for oversharing, and that can be downright destructive when someone is dying. My grandmother loved the kind of political debates that so often appear on Facebook, and when she was healthy she could dish it out and take it as well as anyone. But when she became terminally ill Facebook debate took a much darker turn. This was her last stand. Disagreeing with her was tantamount to saying “I don’t love you anymore.” It’s hard to communicate a change like that across a screen, and the result was a lot of unnecessary anguish. There are questions of etiquette, too. How appropriate is it to share someone’s fight for life in status updates and liked posts? What’s too soon in a world of instant communication? What’s too late? There was a lot of miscommunication, and a lot of anger. One problem with social networking that affected me a lot was coping with grief. People grieve differently. For me grief is private. I didn’t show much emotion when she died, not because I wasn’t heartbroken, but because I didn’t want to explain my feelings to anyone, or take on any of their feelings. I wanted deal with it alone. I posted a few things in the Facebook group because it made my grandmother happy, but for the most part I kept my feelings to myself. Some people need to share their hurt with the world, and that is a valid means of coping too. But it’s best done with people who grieve the same way, not with everyone. Because of Facebook I lost some aspects of the private grieving I wanted. I saw everyone’s feelings for weeks and weeks. And what could I do? Leaving the Facebook group would have meant losing updates on my grandmother that I did want, plus it would have deeply hurt her feelings. So I stayed in and did my best to put blinders on whenever anyone posted in the group. And now there is the question of what to do with my grandmother’s two Facebook accounts. Personally, I would want my account deleted. Facebook is filled mostly with superficial nonsense that only people who expect to see a lot of tomorrows can muster the energy to care about. It’s not what I want to leave behind when I die. There are parts of it worth preserving, of course. My loved ones can take whatever pictures or statuses they want to keep, but when I die I want the rest of my Facebook to be gone. But my grandmother loved Facebook. It caused her a lot of frustration, but she could also communicate with all her loved ones and share all her thoughts. Facebook to me is a great time-waster but to her it meant being an active participant in the modern world. My grandmother had an early career in computer technology, earning a PhD in education, specifically related to computer models, in the 1970s, when both computers and career-oriented women were still new. So being on Facebook also represented her legacy as a woman in technology and her contributions to society. Deleting her Facebooks is not an option. I am of the Facebook Generation. I take social networking for granted, as do my peers. Most of my interactions are as casual as leaving a Post-it note on the refrigerator. My parents and grandparents never had anything like this growing up. They assign different meaning to it, often much deeper and much more volatile. My mother and her siblings are not of the Facebook Generation. They don’t really get Facebook, and it makes them very angry. Right after she made a Facebook, my mom had me screen all of her interactions. Once she almost posted a long private message as a status update, was furious when I told her what would happen, and was annoyed by the whole process of actually sending a private message. My mom is an IT specialist, but social networking is a different game, and she’s frustrated by it. Trying to do anything with my grandmother’s Facebook accounts would be a disaster. Walking my parents through the process of memorializing her accounts would only frustrate them and make them feel as if they were deleting her. There is no way I could do it myself, though the process would be easy for me, because of the significance assigned to her accounts. Only someone who was right there with her when she died has the right to touch her accounts. So the only option is to leave my grandmother’s Facebooks as is. I wish that weren’t the case. I hate seeing her picture sandwiched between a rando I went to high school with and an acquaintance from day camp on my list of friends. I want something different for her. I guess have my own ideas about the significance of Facebook. Perhaps they are unique. Perhaps they are shared by everybody in my generation. I will only find out as we push onward into this weird new world of technology and communication. As I approach this scenario with my own father, you have given me a lot to think about. Great article!